I know, that my question has already asked, but we realy need this function to changing layers resolution. We always print large details (around 4000 - 5000 layers), but only in maybe 100 layers we need resolution 25 microns. Another layers we need to print in 100 microns for economy time. And if you will add this function in PreForm it will be very usefull, I think not only for me. Are you suggesting a UI for manually deciding the layer thicknesses on a layer-by-layer basis? What is different about the layers that need 25 microns vs 100 microns? The difference is saving a large amount of time. The video is very informative! Even better: VariSlice is open source! It “just” took 2.7 times longer to print at this detail level instead of 10 times longer if it would be purely 10 micron. Hi henryk, I remember this has been discussed a couple of times at least in the part and I’m sure at the time Frew took notice of the suggestions. I remember that he was implying that automatic variable layer height was in the minds of some of you guys at Formlabs. @fantasy2 gave the best example possible. Another simple example is printing a sphere. 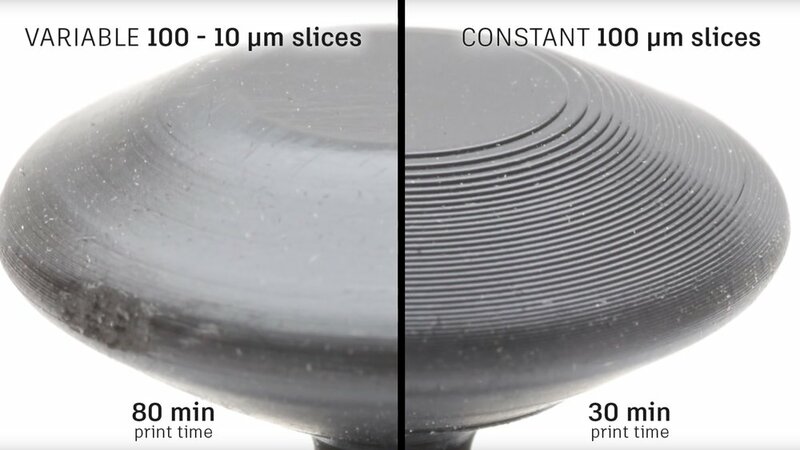 The top and bottom of the sphere could gain from thinner layers but print time would dramatically increase of the rest of the print could be printer at a higher resolution. that’s great for a vertically printed dumbell. But I can’t think of a single shape I have sent to print where the areas I need high detail versus low detail are so neatly arranged in perfect horizontal bands. I would not even print this dumbell vertically as shown. My concern with SLA would be that varying thicknesses might result in varying warpage and dimensional inaccuracy. Luckily we all print something different. I have plenty of examples where it would benefit(fixtures for example). It’s a self adjusting algorithm. So even if you could save only 100 layers, that’s still a time saver and 99 layers less risk of a failure. Prints always finish later than you want so now that would be a tiny bit(or a lot) less. Printing in nth layers might not be so easy as the exposure settings are different between the 25, 50 and 100 micron layers. It might be possible to base on slope but would require some user marking of what parts of the model get what layer thickness. Also not sure if the peel forces for 100 micron be too great that lower layer thicknesses below may distort or shift. IE first 50 layers at 25 might be crushed or shift as 100 are printed on top. now that we have different resolutions in supports and model , its possible have different resolutions in the model? just like slash 3d printer https://www.kickstarter.com/projects/644653534/slash-the-next-level-of-affordable-professional-3d/description sorry for my english!! Sometimes I have prints that look better being printed at .025 layer height due to curved features. However, parts of the model could be printed at a higher layer height. So what I’m suggesting is to allow in Preform a way to specify z height “zones”. Each zone has a user defined start and end z height, and can be any layer height for the given material. This would reduce the print time on areas that are less critical. We have this partially incorporated in that support structures print more coarsely than the rest of the object. We’re looking into a few workflows, one of which would be a user configurable feature, and another that would make automatic judgements based on the delta between X/Y outlines on consecutive layers.